Optimal Esthetics – All-ceramic crowns are considered to be more natural-looking when compared to PFM crowns. The internal metal framework of PFM crowns requires that a very opaque, white porcelain layer be used to conceal the metal underneath. Unfortunately, opaque porcelain does not offer the translucent qualities necessary to create a natural-looking restored tooth. Furthermore, the grayish metal portion of the PFM crown can show through at the gumline and becomes more pronounced with time. Crowns made from e.max® and zirconia are completely white and offer varying degrees of translucency (based on the strength and density of the specific material). All-ceramic crowns can also be customized to blend with your surrounding teeth, which makes them the ideal choice for restoring prominently visible teeth. Hypo-Allergenic – For patients with metal allergies, hypo-allergenic, all-ceramic crowns are highly recommended over PFM crowns. PFM crowns can cause an irritated and inflamed gum line. Over time it speeds up and increases gum recession. Strength & Durability – State-of-the-art, high-strength e.max® and zirconia variations can offer the strength and durability necessary for back molars. These types of all-ceramic crowns are virtually as strong as, or stronger, than PFM crowns. 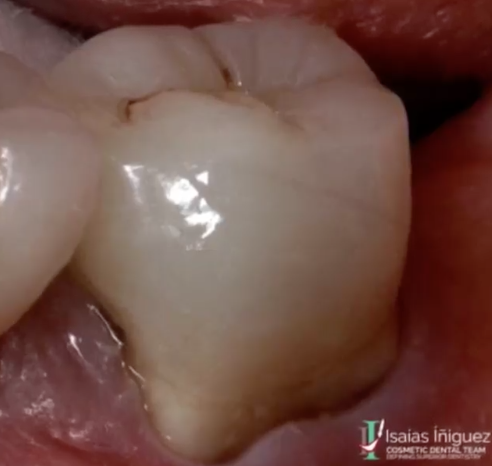 Over time, it is common for the porcelain layer of PFM crowns to chip or break off. Less Wear to Natural Teeth – Natural tooth enamel that regularly comes in contact with or rubs against PFM crowns—during chewing, clenching, or grinding—can sustain a problematic degree of wear. This type of wear can affect the bite and make natural teeth more susceptible to decay and sensitivity. The smoother surface of all-ceramic crowns prevents this common type of wear from occurring. Lifespan – While both all-ceramic and PFM crowns may last up to 15 years or more with proper care, the esthetics of PFM crowns tend to degrade at about 10 years. The aesthetics of all-ceramic crowns should stay the same as long as the crown lasts. If you are interested in high-quality, all-ceramic crowns made of e.max® or zirconia we encourage you to contact our practice to schedule an appointment. You will find that our prices for these durable, esthetic crowns are much lower than the prices you will find at cosmetic dentistry practices in the United States. We also offer PFM crowns at a lower price if you are concerned about your budget. « Why Choose Porcelain Veneers Instead of Teeth Whitening?